Bourton-on-the-Water is known as the Venice of Cotswold because of its popular 18th century small bridges in the large village. This is only one of the many sights and sounds of Bourton-on-the-Water you can see and experience when visiting this peaceful and amazing village. One of Bourton-on-the-Water’s popular attractions is the 1:9 scale model of the village itself and the amazing thing about the model village is that it also has a model inside it, how cool is that? And speaking of models you can also find separate model railway in Bourton-on-the-Water. If you like cars and motorcycles then you’ll definitely want to visit the Cotswold motoring museum. The museum was founded by the car collector Mike Cavanagh but years after starting his collection he decided to sell it to the Civil Service Motoring Association. If you’re visiting Bourton-on-the-Water with your family then try out the Dragonfly maze. The Dragonfly maze is a simple but also intricate maze made completely out of yew and has a pavilion at the center. This place will surely give you and adventure and wonderful experience, your kids can play hide and seek or tag while you take a rest on the pavilion admiring the beauty of the maze. Another great place to visit in Bourton-in-the-Water with your family is Birdland. Birdland is a bird zoo that has different species of birds that you can see, touch, and even play. It houses amazing birds with like penguins from the Antarctic and flamingos from Africa. 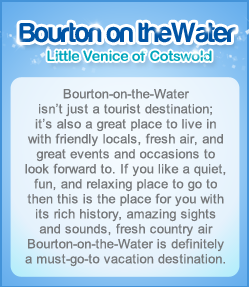 Planning to take a trip to Bourton-on-the-Water during the winter holidays will be one of the greatest vacations you’ll ever have. The picturesque view of the village when winter comes is just amazing. Every year the village also erects their Christmas tree which is absolutely wonderful to look at and the great thing about this is that there are plenty of Cotswold hotels that you can stay where they have a magnificent view of the Christmas tree. Bourton-on-the-Water isn’t just a great place to visit but also a great place to live in. The people are very friendly and you get to pick and choose locally grown ingredients such as vegetables, meat and their by-products which are very fresh and taste. Not to mention that the village holds a farmer’s market every 4th Sunday of the month where you can choose from a smorgasbord of ingredients.